With the Bills playing the Jets this week on Thursday Night Football, sports comedian Jeff Wozer has discovered some possible distractions for the team on their trip to New York City. Players have difficulty maintaining focus during warm-ups knowing they’re missing Wheel of Fortune. On charter flight home at 2 a.m. sleepy-eyed flight attendants go through the motions during safety speech. Players distracted by the gnawing fear Giants QB Eli Manning will access Bills locker room and steal their jewelry. It’s impossible to find a New York City restaurant that will seat a table of 53. Players know Bills fans will tune out after halftime to watch the must-see game between the 3-7-2 Sabres and the 1-10-1 Coyotes. Players become easily distracted from the site of Al Roker in the stands. Players in contract years will feel obligated to spend Sunday at the Pegula’s raking leaves. 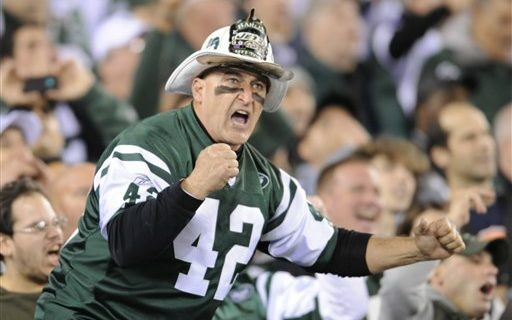 Jets fan Fireman Ed will deter Bills fans from setting themselves ablaze. Players forget hotel’s free weekday breakfast buffet ends one hour earlier than on weekends forcing Pegula’s to splurge on hotel vending machine Pop Tarts. Players are distracted by concerns practicing Giant players will use up all of the stadium’s hot water. Coaches fret players will arrive at stadium with pulled chest muscles from waving madly through Today Show window. For more of Jeff’s humorous observations about Buffalo sports, visit his author’s page at Buffalo Sports Page.